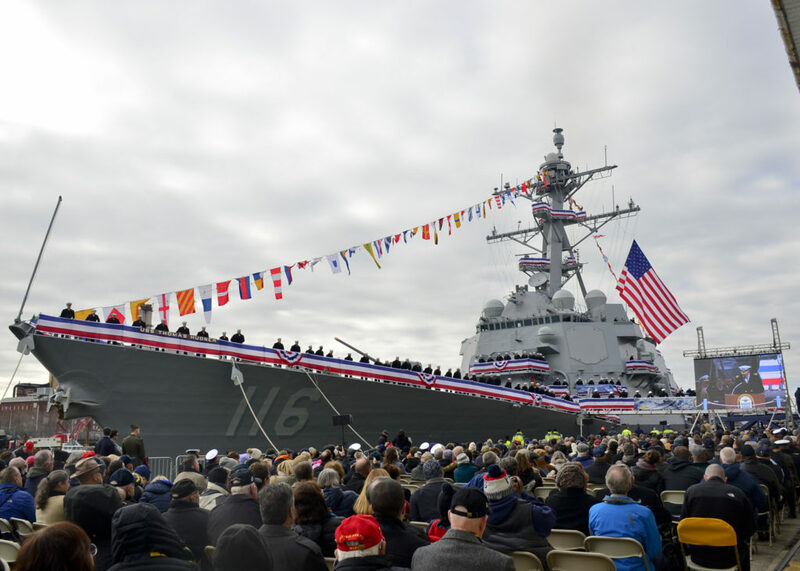 The U.S. Navy commissioned its newest surface combatant, USS Thomas Hudner (DDG 116), December 1, 2018, during a ceremony in Boston. Thomas Hudner, commanded by Cmdr. Nathan Scherry, a Peculiar, Missouri native, is the 66th Arleigh Burke-class destroyer, and the 36th DDG 51 class destroyer built by General Dynamics Bath Iron Works (BIW). It is the first warship named for naval aviator and Medal of Honor recipient Capt. Thomas J. Hudner, Jr.
Capt. Hudner, a native of Fall River, Massachusetts, received the Medal of Honor for his heroic actions during the Battle of the Chosin Reservoir in 1950. Hudner crash landed his plane in a selfless effort to save the life of his wingman and friend, Ensign Jesse Brown, the Navy’s first African American aircraft carrier qualified naval aviator. Among the distinguished guests and speakers at the commissioning, Thomas Hudner III, son of Capt. Hudner, gave a speech about his father’s life and legacy. Massachusetts Governor Charlie Baker delivered the principal address at the ceremony which was attended by Chairman of the Joint Chiefs of Staff General Joseph Dunford, Secretary of the Navy Richard V. Spencer, Mayor of Boston Martin Walsh, Congressman from Massachusetts 8th Congressional District Stephen Lynch, Vice Chief of Naval Operations Admiral William Moran, and others. The ship’s sponsors, Mrs. Georgea Hudner, wife of Capt. Hudner, and Mrs. Barbara Miller, former Co-Chair of the Flag Officer Spouse Training, gave the traditional order to “Man this ship and bring her to life,” signaling the Sailors to embark and officially begin service as a U.S. Navy ship. For the ship’s crew, the day was the culmination of a few years of work to get USS Thomas Hudner prepared for commissioning. The day was a special opportunity to bring the ship to life in Boston, where the legacies of great ships and great people are kept and revered. In fall of 2015, the keel of Thomas Hudner was laid down. The ship was christened on April 1, 2017 during a snowy ceremony at the BIW Shipyard in Bath, Maine and launched several weeks later on April 23. This entry was posted in Commissionings and tagged commissioning, commissionings, thomas hudner. Bookmark the permalink.